Posted Jan 04, 2018 by Eds. The following is an introduction given by Colin Barker of Manchester rs21 to a panel discussion to launch the book Social Reproduction Theory: Remapping Class, Recentering Oppression at the recent Historical Materialism conference in London. Social Reproduction Theory (SRT), as illustrated by the excellent new collection edited by Tithi Bhattacharya1, is both a heady brew, and a very productive line of thought. Its starting point involves a critique of the one book which might stand in for a ‘bible’ in Marxism: the three volumes of Marx’s Capital. Capital is of course a famously unfinished work. Volume III breaks off just as Marx is about to discuss classes (and presumably class struggle). Originally, Marx planned a six-volume work, to include Books on the State, International Trade and the World Market and Crises.2 So far as I know, not even the barest outlines of these exist in his surviving manuscripts. While he did write about Rent, he intended to recast the whole discussion in the light of the materials on Russian peasant agriculture he was furiously working on in the 1870s. He makes reference to a planned further work on Competition. The discussion in volume III of the ways that surplus value is distributed as industrial and commercial profit, interest and rent makes no mention of a further form—State Taxation.3 And, of course—the very starting point of SRT—Marx offers no serious discussion of how his important theoretical discovery, labour-power, is produced and reproduced. The holy work, it turns out, is very holey. A lot more needs adding if we are to possess a useful guide to understanding and changing the world. Then the question is posed: how to proceed with the needed adding and filling in? Two different approaches have developed, across various lines of inquiry. Social Reproduction Theory, at least for the authors in this volume, seems to follow the second strategy. One part of that strategy involves identifying key preconditions of capitalist reproduction. At the centre of Marx’s conception of capital is ‘value in motion’.9 Value passes through phases of production (where surplus-value is generated), of realisation and of distribution in repeated circuits of expanded societal reproduction that incorporate and subordinate ever-widening fields of human social activity. Its motion, however, is dependent on a whole series of conditions which are not themselves directly subject to the laws and assumptions of market exchange. Marx extensively discusses one of these, the ‘hidden abode’ of production, where labour power purchased in the market-place loses its freedom and is subjected to the despotic rule of capital as its energies are converted into abstract labour. Here liberty and equality end, and subordination reigns.10 Unfreedom, in various guises, is a necessary underpinning of capitalist reproduction. Social Reproduction Theory begins with an inquiry into another precondition of capitalism: namely, the sale and purchase of labour-power, that unique commodity whose consumption is capable of producing more value than it itself costs. How and where is labour-power produced, to what purpose and to whose purpose? Is this, indeed, itself an act of ‘production’? These questions began as Marxist-Feminist questions, but like all productive questions, they ramified beyond their origins as their implications were explored. Capitalist production reproduces in the course of its own process the separation between labour-power and the conditions of labour….The capitalist process of production,… seen as a total continuous process, i.e. a process of reproduction, produces not only commodities, not only surplus-value, but it also produces and reproduces the capital-relation itself; on the one hand the capitalist, on the other hand the wage-labourer. Capitalist production reproduces… capitalist society, with its classes and their antagonisms. Existing workers must be regenerated or maintained on a daily basis. That regeneration and maintenance must also be performed for non-workers—including children, the aged, the sick, and other dependants. New generations of workers must be born and nurtured to replace those who leave through illness, old age and death. 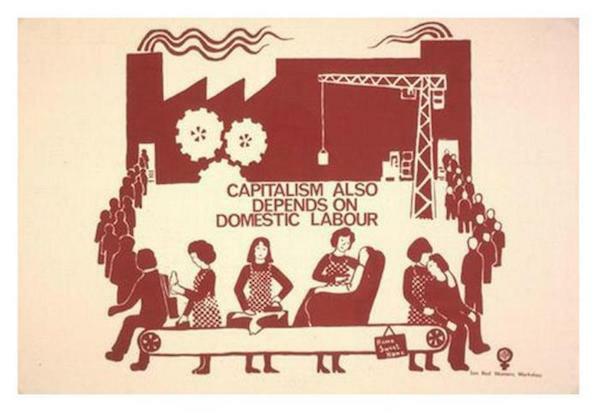 Not surprisingly, given its origins, much of the literature on social reproduction has focused on the family-household as a key site where labour-power is reproduced. What started as a set of Marxist-Feminist inquiries into the nature of ‘domestic labour’ and its relationship to the rest of political economy has mushroomed out in different directions. Outside the work of the factory inspectors (largely praised by Marx) and some attention to the reports of Medical Officers of Health, Marx pays little attention to another condition: state intervention into the conditions of reproduction of the working class. The issues involved would, of course, become much more central during the course of the succeeding century and a half. They would also considerably widen the field for examination by social reproduction theory well beyond the family-household—and for engagements of all kinds in class struggle. The conditions under which working-class people rent and purchase housing, the quality of urban life, transport, education, water and sanitation, health and medicine, pensions, hours of work (and travel), the quality of food, the supply of electric and gas power and fuel would, with many other issues, come to play central parts in class struggles across the globe, requiring an expanded notion of class struggle itself and of the social movements through which it is conducted.14 In a recent Facebook discussion the idea of a further volume, on States and Social Reproduction, was mooted. We probably need it—and perhaps we could hope that Tithi Bhattacharya might help edit it. What is produced and reproduced is not simply the economic category, labour-power, but the labourer herself or himself, the active producer, a definitely acculturated historical being, a self who is what Marx and Gramsci variously termed a nexus or hub of social relations and social activities.15 If workers are the agents of their own reproduction, what they produce is themselves as agents. The ‘abstract labour’ which provides the measure of value is the output not of abstract figures, but of concrete, historically situated and history-making real individuals. The labourer/producer is a gendered and racialised person, with ideas, history, social relations, skills, culture. This person, the labourer (or member of the working class), is an active ‘philosopher’, trying to make some kind of sense of the world about themselves and to act within it in a satisfying manner, where what counts as ‘satisfying’ is itself at once the object of active reflection or reflective action and the product of previous historical development. Michael Lebowitz’s contribution to the discussion, in his book Beyond Capital, is, crucial in one central matter.16 Noting that—even if Marx devotes a long chapter to the 19th century battle over working hours—the struggle between workers and capital over wages plays no significant part in the structure of Capital, Lebowitz posits, alongside and in vital respects antagonistic to the reproductive circuit of capital, a second circuit, that of the production and sale of labour-power. The labour performed in this circuit does not fall under the direct aegis of capital: within the limits that capital imposes on the resources available to them, those who reproduce labour-power do so under their own steam. Further, not only are the ‘drivers’ of this circuit workers themselves, but their motives for production are quite distinct from those that drive the competitive accumulation of surplus-value. These motives are the workers’ own needs—not simply for material goods for consumption, but also for enjoyment, self-development, the ‘free play of their own physical and mental powers’, for social life. The inter-relationship between capitalism’s two circuits is the very heart of the class struggle. What is ‘missing’ then from Capital is not simply the production of labour-power as an ‘economic’ category, but something more fundamental: the very principle of the self-activity of workers, in particular in opposition to capital. This suggests that in reading Capital, as a critique of political economy, we need to leap beyond the limits of the dismal science whose adversary it is, to encompass not only the movements of capital but also the social and political struggles going on within the society whose ‘anatomy’ political economy provides. This takes us beyond a vision of capitalism as a closed system resting on one principle, the self-expansion of value, to one of a more open system at whose centre lie struggles between opposed principles. Elsewhere in Marx’s writings (though not in Capital) this is registered as a conflict between opposed political economies: that of capital and a ‘political economy of labour’. In the 1860s, Marx identified two forms particularly in which this was manifested and in which some gains had been made: first, the long battle to impose legal limits on the working day, and second the formation of cooperative workshops, whose existence was a demonstration that production could be carried on without bosses. Marx, in Capital, presents the production of workers as largely compliant. But this is ‘one-sided’. Socialists may be disappointed at the ‘level’ and the ‘quality’ of resistance at any one time, but it would be a strange account of capitalist society that did not recognise its role in shaping the forms of its development, including the very ‘freedom’ of workers to enter and leave wage contracts, all manner of freedoms (and their absence) in the sphere of reproductive struggles like access to contraception and abortion, measures to equalise the legal rights of men and women, the development of state ‘welfare’ measures, the right to strike and to form unions, the right to assemble and demonstrate, the suffrage, and so on. But if ‘class struggle’ is to be re-centred as critical to our understanding of capitalism and its reproduction, capital itself—and its representatives and its states—need also to be understood as active in seeking to shape the ways that labour itself is active. Labour’s pursuit of its ‘self-development’ poses not just economic but political and ideological problems for capital and states alike, requiring interventions and controls at every point. In a brilliant essay in the early 1960s, Edward Thompson wrote of how the British working class had ‘warrened society from end to end’18, but he neglected to mention the reverse side of this: the ways that capital and the state have warrened the workers’ movement from end to end, co-opting, limiting, corralling its forms of activity. The ‘making of the working class’, the shape of its social reproduction, has always been a contested terrain. The class struggle is not simply fought between already-formed entities, but is the very means through which popular classes ‘make themselves’ to become, or not become, ‘for themselves’. A slightly shorter version of this article was published by Pluto. ↩ This is especially odd, given that the fifth book of Smith’s The Wealth of Nations deals with the state, while Ricardo’s most famous book is entitled The Principles of Political Economy and Taxation. ↩ The term ‘deepen’ is mine; Nancy Fraser talks about ‘extending’, Nancy Holstrom about ‘supplementing’, and Tithi Bhattacharya about ‘analytically broadening’ Marxism; while Satnam Virdee intriguingly promises a new book on ‘Stretching Marxism’. ↩ A not dissimilar spirit seems to lie behind Teodor Shanin’s and Kevin Anderson’s explorations of some of Marx’s less well-known writings; or indeed Paul le Blanc’s recent call for a more ‘open’ account of Marxist theory, away from ‘too narrow’ conceptions of capitalism. Teodor Shanin, Late Marx and the Russian Road: Marx and ‘The Peripheries of Capitalism’, Routledge, 1983; Kevin Anderson, Marx at the Margins: On Nationalism, Ethnicity, and Non-Western Societies, University of Chicago Press, 2010; Paul le Blanc, ‘Explorations in Plain Marxism’ in Revolutionary Studies. Essays in Plain Marxism, Haymarket, 2017. Developments within Marxism of this kind seem to occur in some periods more than others. Under the impact of the ‘Red Years’ from 1917 and after, a whole series of thinkers sought to ‘extend’ Marxist thinking in a variety of spheres: e.g. Gramsci, Mariátegui, Pashukanis, Rubin, Vološinov, Vygotsky. Likewise the impact of the ‘sixties’ was felt in field after field of practical and theoretical inquiry across the face of Marxism, from Marxist-feminism to state theory to social work and mental illness; a little later, in response to some of the excesses of ‘postmodernism’, significant work on Marxism and language was produced, often drawing on Vološinov and Vygotsky. ↩ David Harvey, Marx, Capital and the Madness of Economic Reason (2017) offers an impressive graphic representation, comparing it with the hydrological cycle. He might also have drawn on another Harvey to illustrate the circulation of the blood. ↩ For the purposes of analysis, Marx assumes the legal freedom and equality of the labourer in the market-place, where he strikes his bargain with the capitalist. Yet this is a partial fiction. It was not until eight years after the appearance of Capital that the Master and Servant Act was repealed in Britain. Until then, workers were regularly jailed (and beaten) for ‘breach of contract’ (Heide Gerstenberger at the book launch for her new book Markt under Gewalt at the HM Conference, November 2017; Marc Steinberg, England’s Great Transformation: Law, Labour and the Industrial Revolution, University of Chicago Press, 2016). Elsewhere, both slavery and serfdom proved compatible with capitalist production (Jairus Banaji, ‘Modes of Production in a Materialist Conception of History, Capital & Class, 1977). ↩ The main source of means of production for the reproduction of labour-power is the wage, a form deficient in terms of matching need and supply. The wage is not paid according to need, but for hours worked by the individual. Yet it must cover the needs of the entire household. In late 19th-century York, one study pointed to age-related cycles of poverty, depending on how many of the household were able to bring in wages. The best-off families were those with working teenage children. Reductions in demand for child and teenage labour, along with the extension the years of state-controlled formal education led to reductions in family sizes and increases in the proportions of married women taking outside employment. Divisions of labour, and patterns of relations between men and women, between parents and children, and indeed between grandparents and children, varied and shifted under the impact of changes in numbers of factors: demand for labour, state restrictions on children’s and women’s employments, birth rates (and the availability of effective contraception and abortion), changing forms of housework burden. The constraints of biological difference, especially as regard birth and lactation, gave men and women different ‘career profiles’. ↩ If anyone doubts that such ‘social reproduction’ questions, beyond the immediate sphere of the workplace, are central to ‘class struggle’, they should seriously consider the past four decades of neo-liberalism. Capital and its states have been attacking globally on two fronts together: on workers’ organisation in unions and on the means of social reproduction of the working class.